As social media manager, I love promoting JMYS through our website, Instagram, Facebook, etc. ; but my one of my favorite parts of the job happens outside of the digital screen. 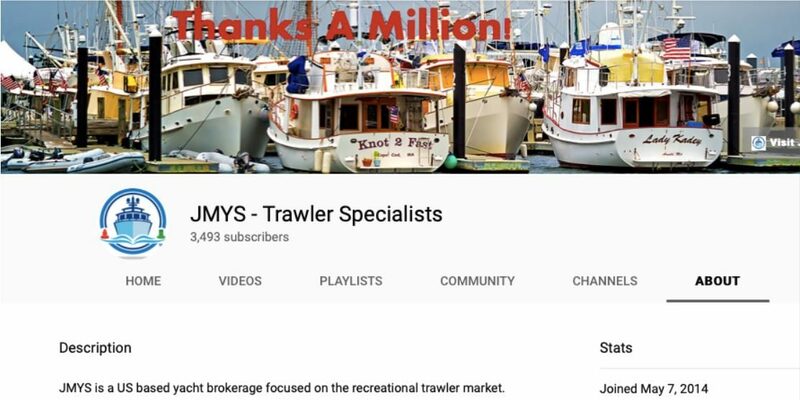 Trawler Fest is an event I look forward to having attended several of these events! 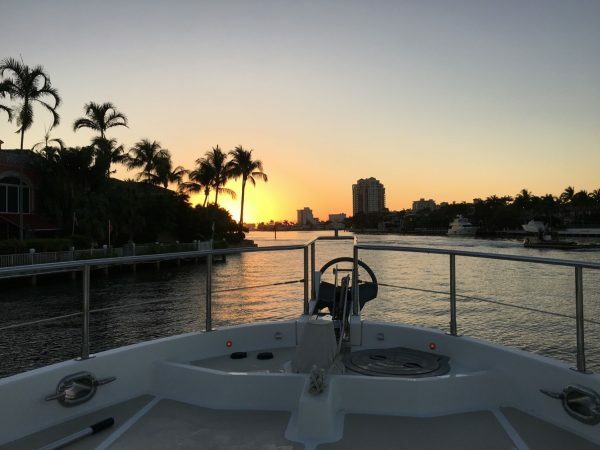 I love getting to meet clients, enthusiastic boaters, and other brokers. Not to mention, it is pretty fun getting to be aboard trawlers all day. 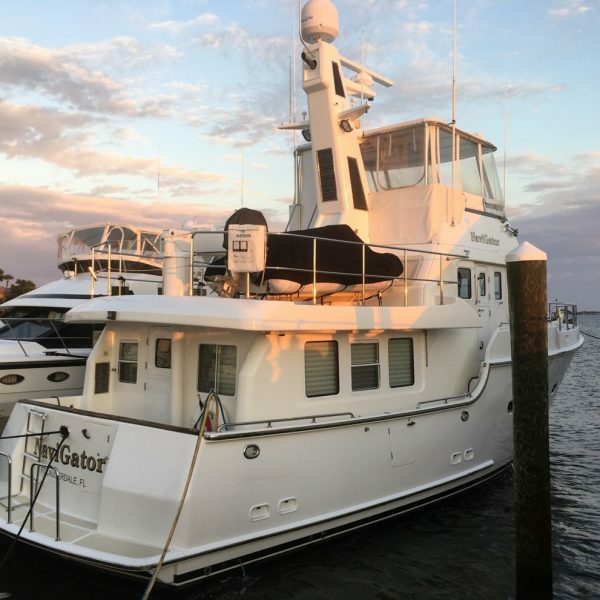 To help get ready for this year’s Stuart TrawlerFest I had the privilege of crewing while moving our listing, NaviGator, up from Fort Lauderdale to the event marina in Stuart, FL. I have met the owners, Mike and Patsy before, and they are extremely hospitable. I always enjoy their company and it felt like a family outing. Mike, Jeff, and I woke up early Monday morning and were off the dock by 7am. Seeing the sun rise over the ocean from my seat on the flybridge was a real treat for this US west coast born girl. On our exit through the harbor we saw cruise ships heading east toward the Bahamas. As I sat there, coffee in hand, I thought this had to be the best “work” I’ve ever done on a Monday. Our cruise up the coast was incredibly smooth and the sun was shining. It as a perfect weather day for Florida in March: 85 degrees and sunny! I later learned that we were cruising on what turned out to be the warmest day in Florida so far in 2019. 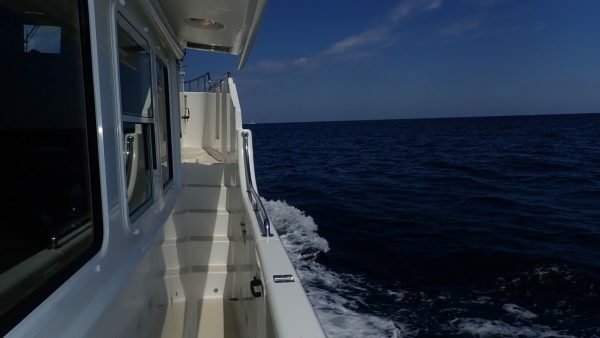 We traveled about two miles offshore and rode the Gulf Stream current north. I saw flying fish from the bow and lots of Scuba dive boats anchored out with dive passengers exploring under water. Mike let me take the controls a few times while he checked the engine room. 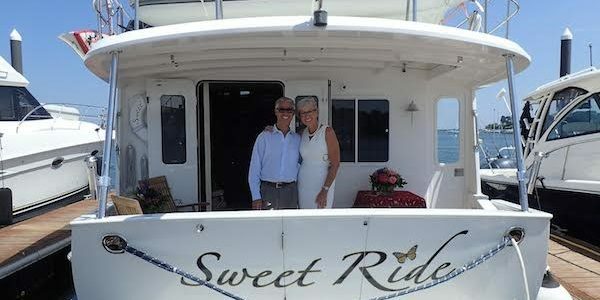 Our ride couldn’t have been easier and before I knew it, we were turning left into the Port St. Lucie Inlet. One lesson that I hope to memorize from our trip, and hope not to have to learn again the hard way, is how quickly the intercoastal waters get shallow. 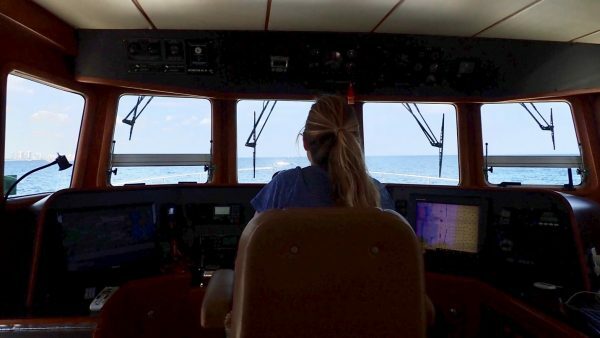 I could see sandbars all throughout the mouth of the entrance and alongside the channel markers as we worked our way inside. 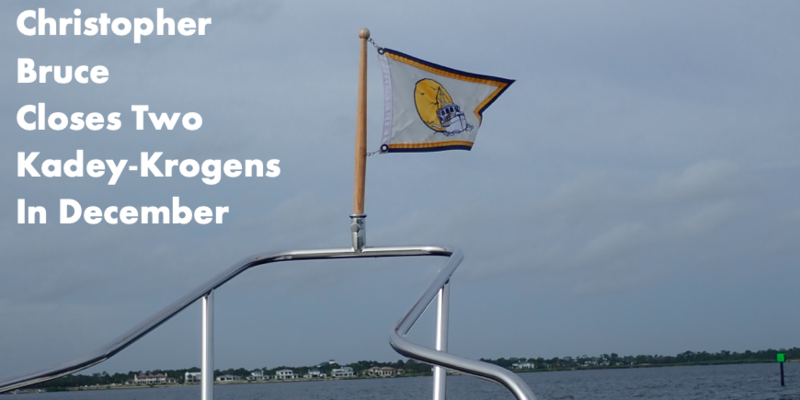 We arrived at the TrawlerFest marina (the Hutchinson Island Marriott) and Mike expertly captained a swift, precise docking in spite of the pilings and concrete docks that would pen us in. As we finished tying up we were welcomed with a typical Florida afternoon rain shower. We sat aboard and enjoyed a glass of wine while we waited for the squall to pass…again, I smiled inside and thought again that this was not a bad way to spend a day at “work”. Once it cleared up, we finished securing NaviGator and then ate dinner in the hotel and talked about our plans and excitement getting ready for the show. cruise up the coast and run offshore on a Nordhavn 47. The day proved to be great preparation getting me ready for the days ahead once the show started and I was tuned up for giving tours and showing off NaviGator during TrawlerFest.